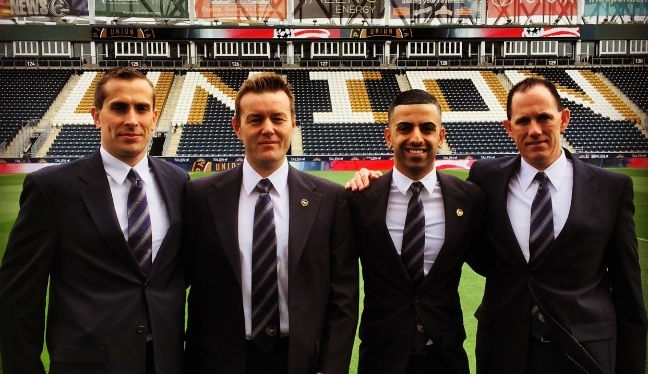 Nima Saghafi‘s opportunity as a MLS center official arrived in Week 3 of the 2016 season, and it’s a debut that the PRO official is unlikely to forget in a hurry. You’d probably struggle to find a referee who doesn’t remember their first game with the whistle, but the match-up between Philadelphia Union and New England Revolution threw up more incident that most. One red card brandished and two penalties awarded, it was certainly a busy day at the office for Saghafi, but one that the 26-year-old was more than happy with. “I felt the game went very well, there were three match critical decisions and each time the whistle was blown I was 100 per cent certain of my decision,” Saghafi told proreferees.com. “That said, there is always room for improvement and it is key for me to always go back and watch the match, minute-by-minute, re-evaluating movement, management and overall decision-making – learning from my mistakes and understanding additional options in each situation. “Facing this assignment, it was understood for us as a team to be successful it was key to maintain a high level of work rate for 90+ minutes. Always remaining calm, focused and never allowing any situations to surprise us. Although it was his first MLS game in the center, Saghafi arrived at Talen Energy Stadium well prepared for the occasion following a strong 2015 with PRO. The young official was assigned to last year’s USL Championship game, adding to further call-ups in the regular USL and NASL seasons. Saghafi was also handed fourth official duties on 21 occasions in MLS last term, and kicked off this campaign with two more appearances on the sidelines before earning his opportunity in the middle. Vital experience gained which assisted him when it came to the game, which finished 3-0 to the Union. “This was the most crucial match I had done in my career thus far, the atmosphere was phenomenal. Pressure is to be expected on any critical assignment but you must always maintain your standards and a high level of discipline to stay focused on the task at hand. “Being in my second season in MLS, I have been fortunate enough to be on the touchline and understand the speed as well as intensity of each MLS match, but also lucky enough to learn and be guided by the best. “Every match I learned something new and different, both from the appointment itself but also from the way the referee conducted himself. I feel this was tremendously successful in me being prepared for my first assignment.